The final evening of the annual Emerging Voices lecture series features Gabriela Etchegaray and Jorge Ambrosi of AMBROSI | ETCHEGARAY and Neri Oxman of Mediated Matter Group, MIT Media Lab. Emerging Voices spotlights individuals and firms based in the United States, Canada, or Mexico with distinct design voices and the potential to influence the disciplines of architecture, landscape architecture, and urbanism. Jorge Ambrosi and Gabriela Etchegaray founded Mexico City-based AMBROSI | ETCHEGARAY in 2011. The firm considers “architecture in harmony with nature, where earth, gravity and light must be present.” Current projects include Papalote Museo del Niño, an outdoor “museography-landscape,” as well as a collaboration with GMexico Mine Company to build cultural plazas and sports infrastructure in local communities. For more on AMBROSI | ETCHEGARAY, click here. 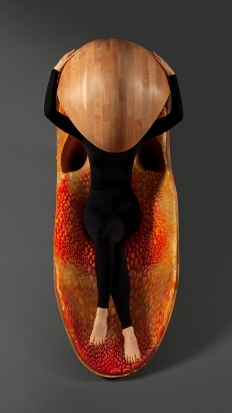 Neri Oxman founded Mediated Matter Group at the MIT Media Lab in 2010. Concerned with how “digital design and fabrication technologies mediate between matter and environment to radically transform the design and construction of objects, buildings, and systems,” Mediated Matter Group’s research merges “computational form-finding strategies with biologically inspired fabrication.” For more on Mediated Matter Group, click here. Billie Tsien is the partner and founder of Tod Williams Billie Tsein Architects. She is the president of The Architectural League and served on this year’s Emerging Voices committee. Tickets are free for League members; $10 for non-members. Members may reserve a ticket by e-mailing: rsvp@archleague.org. Member tickets will be held at the check-in desk; unclaimed tickets will be released fifteen minutes after the start of the program. Non-members may purchase tickets online here, beginning March 19th until 5:00 p.m. March 26th. Additional non-member tickets will be available at the door for purchase with cash, space permitting. Emerging Voices is generously supported by Elise Jaffe + Jeffrey Brown, Maharam, and the Next Generation Fund of The Architectural League. Additional support is provided by The Mexican Cultural Institute of New York. Emerging Voices is also supported, in part, by public funds from the New York City Department of Cultural Affairs in partnership with the City Council. Architectural League programs are supported, in part, by public funds from the New York State Council on the Arts with the support of Governor Andrew Cuomo and the New York State Legislature.